Located on 12th Avenue in the historic Mayfair neighborhood of Conway – about 20 miles from Bay View Resort – Conway Glass is a full-service glass company that has served the Grand Strand since its founding over 30 years ago in 1986. The company’s 100-year-old, recently restored brick building houses a gallery featuring mixed-media sculptures, vases, bowls, ornaments and other works of glass, as well as four professional craft studios, including a stained-glass studio, a dye studio, a fiber studio and – most pertinent to this article – a glass-blowing studio. 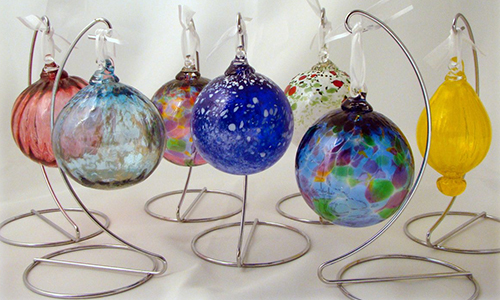 During the holiday season, Conway Glass holds ornament-making workshops, as well as private glass-blowing classes and parties, where guests can create their own custom glass ornaments. Participants choose the style and colors of their ornament creations, then the studio’s professional artists/instructors help them through the processes of heating the glass until it’s soft and malleable, adding their desired colors, and forming the glass into the desired shape before letting it cool and harden. The glass ornaments are available for pickup the following business day, and they make for great gifts – or beautiful decoration for your own Christmas tree. Other glass-art projects that guests can learn to create in the studio’s glass-blowing classes include vases, paperweights, bowls, glass pumpkins and more. For more information about Conway Glass and its many offerings, visit conwayglass.com. To learn more about all of the different glass-blowing classes offered at the studio, along with more on how to schedule your appointment, visit conwayglass.com/classes. Conway Glass is just one of many businesses on the Grand Strand where you can let your creativity and imagination run wild. Book your Myrtle Beach getaway at Bay View Resort today, and come see why Myrtle Beach is such a great place to find your inspiration!